The growth of the Internet has marked a rapid rise in the use of cloud computing services and apps. Just check out our list. There are cloud-based solutions for storage, for online presentation, for file syncing, for note-taking (like our favorite, Evernote), for accounting and finance, for pretty much anything. There are also cloud-based solutions that are purely for backup. One of them is Mozy, which we’ll look at and briefly review here. 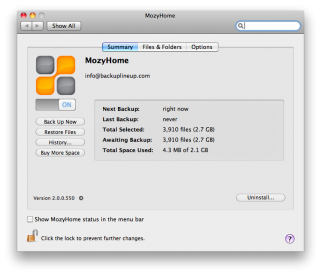 Mozy is an online backup service for Windows and Mac, with features for backing up data continuously, manually, or according to a user-defined schedule. The data and files are stored in offsite servers, which basically means that if your laptop was stolen in a café or if your desktop computer died a terrible, virus-caused death, then your most important documents are still safe and sound – and can be retrieved anytime from the Internet. Getting started with Mozy is easy, although you do have to sign up for an account and then install an application / software in your desktop. Don’t worry: the application is lightweight and has a minimal effect on the operation of your computer while it runs in the background. The new Mozy 2.0 version is also greatly improved, well-designed and extremely user-friendly, making backup easy for the non-technical users. Once installed, Mozy will then scan your computer’s hard drive automatically, find the files and folders that it will backup, and show you a summary of those files and folders. 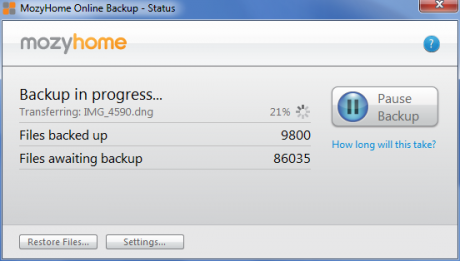 Or you can customize the scope of the backup by choosing the hard drive or folders yourself. You can also customize how frequently your data will be updated and backed up: continuously, manually, or according to your own created schedule. Backed up files can then be made accessible from the actual Mozy desktop client, the Mozy website, or through DVD copies of the data that you can ask Mozy to send you. Just how much data can Mozy back up? With a free account, you can back up 2 GB of data from up to two computers for an unlimited period of time without cost. (You receive an additional 0.5 GB of storage space for each user you refer.) With a MozyHome account (its consumer product), you get an unlimited backup package for an affordable, attractive $4.95 a month – plus live chat and other support features. With Mozy’s business product, MozyPro, you get a remote backup utility that’s enhanced by additional functionality – including your own desktop or server licenses – and an administrative portal. Like other cloud computing tools and apps, Mozy protects users’ data with military-grade encryption and a secure 128-bit SSL connection. It also enables users to create local backups of their data using the same application, so that apart from offsite servers and online destinations, your data also has easy-to-restore local copies. This allows for an extra level of redundancy that not many cloud backup services are able to provide within a single user interface. Mozy does have a mobile client to view files that have been backed up, and I’m using their file sync/share feature now. I concur with Brian. I have attempted to cancel five times in this past week. They keep on assuring me that it has been canceled but then I was just charged again yesterday! Their instructions on how to cancel are intentionally confusing and misleading and their customer service is clearly inept.